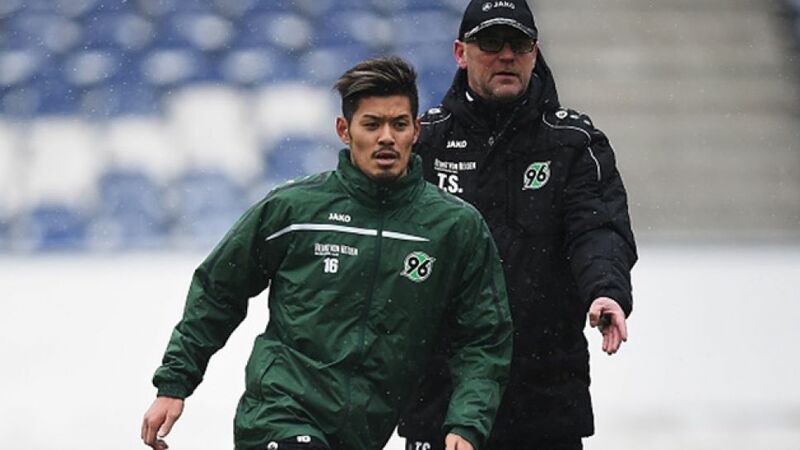 Hannover 96 newcomer Hotaru Yamaguchi intends to channel his inner Arturo Vidal in the months ahead. Click here for our mini-site on FC Bayern's Arturo Vidal. "He’s my favourite player, who I try to emulate," said Yamaguchi of the combative FC Bayern München midfielder. "Defensively we have a lot in common, but he scored goals, especially at Juventus. I want to do that." With only FC Ingolstadt 04 (11), SV Darmstadt 98, SV Werder Bremen and TSG 1899 Hoffenheim (all 17) scoring fewer goals after 17 matches than 17th-placed Hannover (18), new Reds head coach Thomas Schaaf will be hoping the Lower Saxony club’s latest Samurai Blue acquisition delivers. "The team didn’t score enough during the Hinrunde, I want to see more intent in front of goal," Schaaf explained, before reeling off the qualities of Hannover’s new No.16. "I spent a few days in Japan while I was off. [Yamaguchi] is an interesting player: he works and runs hard and reads the game well." Thomas Schaaf on what lies ahead for Hannover 96. For Yamaguchi himself, formerly of J-League 2 outfit Cerezo Osaka, the Bundesliga should provide the ideal platform on which to hone his craft. Indeed, despite being a big draw in his homeland, the 24-time Japan international has had designs on a move to Germany’s top flight for a number of years. "At the World Cup in 2014, I noticed that a few things were missing from my game and I came to the decision that I wanted to get better," the 25-year-old midfielder recalled. "I hope that I’ll be able to put my fighting spirit to good use and help Hannover reach their goals. I always want to improve." Hannover sign Hoffenheim's Adam Szalai.